Kendall Jenner's new ad for Pepsi has fallen flat. 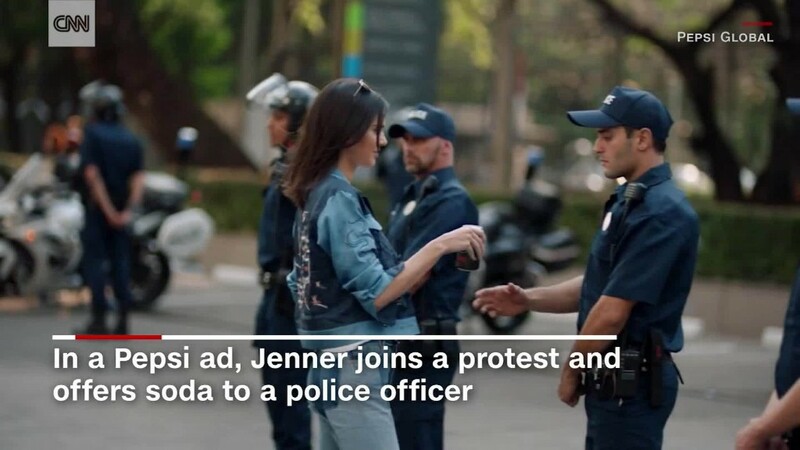 In the ad, Jenner is seen participating in a photo shoot and becomes distracted by a group of protesters. She decides to join them, and toward the end, comes face-to-face with a stoic police officer. She offers him a Pepsi and he accepts the drink before cracking a smile. The imagery was also thought by some to be far too similar to photos of Ieshia Evans, a protester who was detained by law enforcement while protesting in Baton Rouge following the shooting death of Alton Sterling at the hands of police. "Pepsi's new ad Kendall Jenner 'ends racism' by handing police men a Pepsi - way to degrade 50 yrs of black/minority struggle," wrote one person on Twitter. "Can you believe Kendall Jenner solved all the Black Lives Matter issues by giving a Pepsi to a cop? inspiring," wrote another, sarcastically. "Next time @pepsi do one where Kendall Jenner marches to Montgomery but the cops don't bludgeon her bc she's white & has a refreshing @pepsi," added New Yorker contributing writer Jia Tolentino. Community organizer Deray McKesson also commented on the ad, tweeting, "If I had carried Pepsi I guess I never would've gotten arrested. Who knew?" The ad was part of what Pepsi was calling its "moments" campaign. Jenner's ad was called "Jump In," "a short film about the moments when we decide to let go, choose to act, follow our passion and nothing holds us back," according to a company description. In a statement to CNN, Pepsi said: "This is a global ad that reflects people from different walks of life coming together in a spirit of harmony, and we think that's an import message to convey."